All parents know that having a baby can put a strain on the strongest of marriages. But now, new research suggests struggling to have a baby can make divorce or separation even more likely. Danish researchers found couples who have a rocky patch because of failed IVF treatment are three times more likely to end up separating than those who do become parents. The researchers, who published their findings in Acta Obstetricia et Gynecologica Scandinavica, found that within 12 years of failed fertility treatment, 27 per cent of women are no longer living with their partner. They studied 47,000 women with an average age of 32 from the Danish National Patient Registry and the Danish In Vitro Fertilization Registry, Medical Daily reports. The women studied all sought medical help for infertility between 1990 and 2006. A mild reaction to fertility drugs may cause hot flushes, depression or irritabilit, headaches and restlessness. OHSS can be a dangerous over-reaction to fertility drugs used to stimulate egg production. It can cause symptoms such as a swollen stomach, stomach pains, nausea and vomiting. Although the risk of a miscarriage after IVF is no higher than after a natural conception, the risk is not lower. The stress of trying so hard to conceive can compound the grief when a mother loses a baby through IVF. Seven years later, 43 per cent remained childless and they were three times more likely to have separated from their partners than those who had children. ‘This research is important because although earlier research has shown that fertility problems and its treatments are major stressors…especially if the treatments are unsuccessful, we did not know how many of these couples actually decide to split up if they did not get a child,’ lead researcher Trille Kristina Kjaer told Medical Daily. IVF patients have claimed the treatment is as stressful as any other major life event, such as divorce or the death of a family member. For people having the treatment privately, there can be significant financial stresses involved which can put a strain on relationships. The treatment can also cause significant disruption to family, work and social activities which can also cause marriages to become strained. While IVF is very stressful, there is no guarantee it will be successful. For women under the age of 35, there is a 32 per cent chance of each cycle of IVF resulting in a live birth. 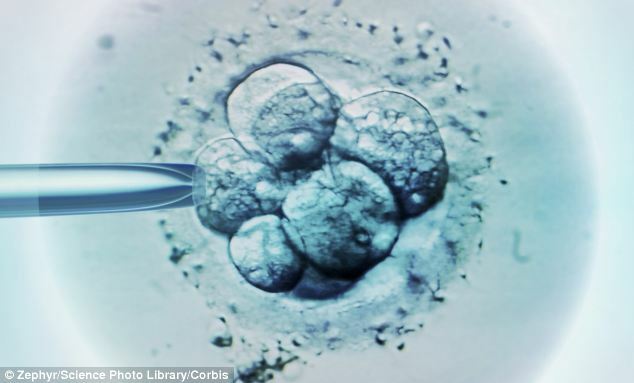 For women who are 40, there is a 13 per cent chance of the IVF being successful.